Welcome to the Berg Adventures International Kilimanjaro and Safari Expeditions 2008. 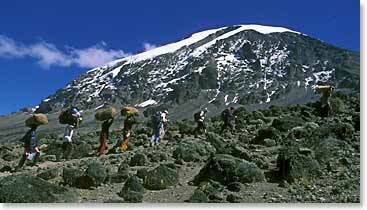 Starting June 23rd our team will start their Africa journey on the Machame Route Expedition. Over the next two weeks, we will be sending updates as we attempt to reach the summit of Mt. Kilimanjaro, the highest point on the African continent. After our climb we will join our driver and guide David, for a spectacular six day safari. We hope you will join us, through the cybercast on this adventure of discovery. July 5, 2008 – Reaching the End of an Excellent Trip! June 28, 2008 – Summit Success on Top of Africa! June 27, 2008 – At High Camp, Going for Summit! June 26, 2008 – We Made it up Barranco Wall! June 25, 2008 – Jambo Everyone! June 24, 2008 – The Sun is Shining at Shira Plateau!